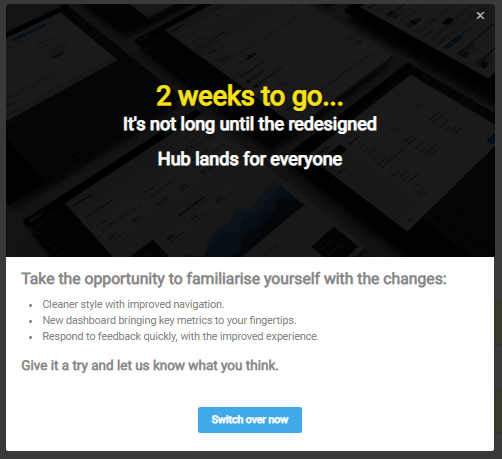 Feefo used Appcues to gradually roll out a major redesign of their user interface. A clever strategy and ample communication with their customers resulted in minimal churn, a 30% user opt-in rate, and plenty of useful customer feedback. We caught up with Feefo's product manager Neil Terry and technical project manager Rhiannon Evans to learn how they did it. 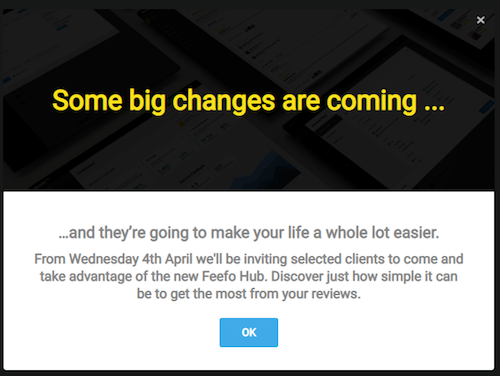 Feefo is a customer review and insights platform committed to collecting honest customer reviews on behalf of businesses so that those businesses can, in turn, provide their customers with feedback they can trust. Over the last four years, Feefo made incremental improvements to their UI; they reached a point where their users were familiar with their product and knew how to use it—but the needle wasn’t moving. Feefo had reached their local maximum—the point at which the limit of the current design had been reached. 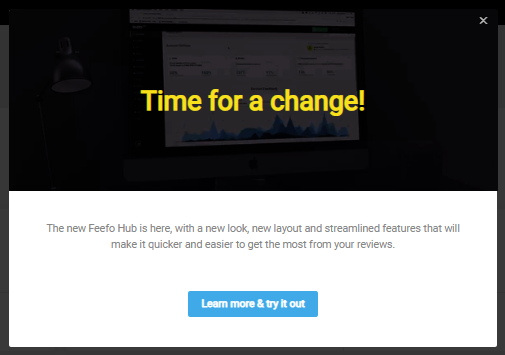 To breathe new life into their product, Feefo decided on total redesign of the Feefo Hub—the control center for just about every user action within the platform—refreshing the look and feel of functionality and navigation. It was a bold move. Handled correctly, an overhaul can take a product to the next level; done wrong, it can torpedo a company’s success. Feefo knew that they ran the risk of churn. To mitigate disruption and ensure a successful transition to their new-and-improved platform, they needed an effective way to communicate with their customers about the upcoming redesign. Feefo’s strategy was threefold. First, the wanted to tease the redesign to generate anticipation and manage any sense of shock on the part of their users. Next, they wanted to transition users to the new interface, while allowing them to revert back to the old environment at any time—provided they fill out a questionnaire explaining their decision. Finally, they would introduce the final redesign to all users. They knew that the most effective way to do all of this was through in-app messaging: “There's no better time to communicate with our customers than when they're in the application using it,” explains Terry. 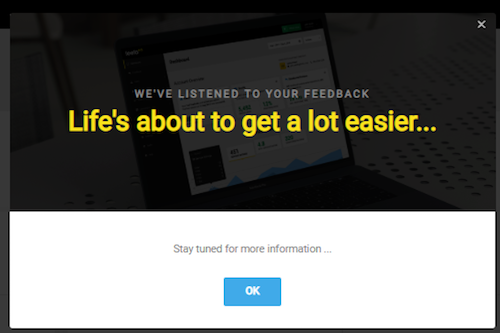 Appcues adds an experience layer over your product, allowing you to publish native-looking announcements, surveys, and onboarding elements. After the initial installation, there’s no coding required, meaning even the most non-technical members of your team can make improvements to your UX. 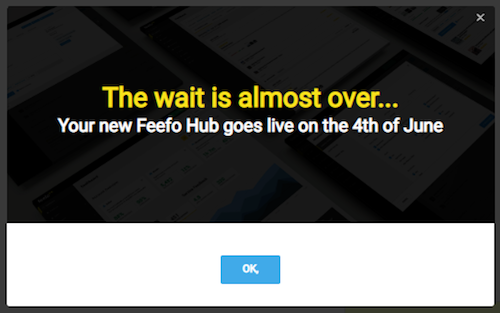 Feefo used customized Appcues modals to communicate with their users throughout the transition to their new design. 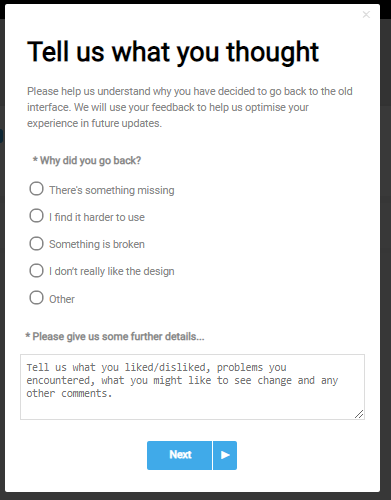 At this stage, users were able to revert back to the old interface if they were unhappy with the new design. In order to do so, however, they were required to fill out a brief questionnaire. By making gradual changes, keeping in constant communication, and listening to customer feedback, Feefo was able to minimize the disruption that large-scale redesigns can cause. They were able to ease their users into a new interface and—by integrating a questionnaire into the process—collect valuable feedback that helped them fine-tune the product before the final launch. Using Appcues to create in-app messages allowed Feefo to deliver the right information to their users at the right time and seamlessly gather user data, all with minimal technical investment.